Today we headed out to pump with the engine and attempt to draft some water. Kevin Gibney met us at the farm and we headed out to a pond in Fawn Grove to set it up for drafting. I recently purchased two sections of used 6 inch lightweight hard suction. We got everything setup and I crossed my fingers as I pushed the primer handle. We waited while the 37 and a half year old former city engine started pulling water. Within 30 seconds the old bulldog started pulling water. We discharged the water out the 2 1/2 inch nozzle I purchased in Allentown. We were able to easily flow 265 GPM and had it up to 600 GPM. Made our maiden voyage or parades for this year! 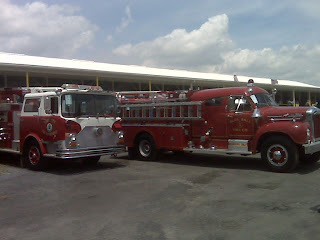 On Saturday June 5th Owen and I went to the Lancaster County Fireman's Convention Parade in Bareville/Upper Leacock Twp. We started our day by picking up the engine at the farm around 9:15. We stopped by Yoe Fire Company to wash and shine her up. Thanks to Grant and Travis for helping get her ready (including fixing the slanted license plate!). Then on the way to the parade we stopped and put half a tank of water in the engine. It was a long and hot ride but we had a good time. We averaged 60 MPH going out route 30. Drove 110 miles round trip. Used about 1/4 tank diesel. Here are some photos from the staging area.